Hadoop has become a hot skill to be acquired in the IT circuit, as the world moves to a digital age. With the literal explosion of data, Hadoop makes it possible to stay on top of it. Since it is one of the hottest paying jobs and there are huge opportunities, people from different domains are now shifting their focus to Big Data. 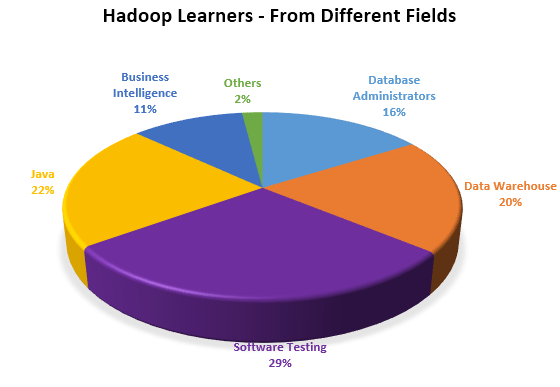 Let’s take a look at our Hadoop learners profile and see what kind of background, experience and geographical locations these learner hail from. Our Hadoop learners are majorly from Software Testing, Java and data warehouse background. There are learners from various fields because numerous organizations are transitioning to Big Data and these professionals are updating themselves with the latest trend in the IT sector, for better and bigger job opportunities. These professionals have realized that there is a huge gap in skill supply and demand and are making use of this opportunity through Hadoop training. Our Hadoop course is aimed at mid-level professionals, but it obvious from the above image that Senior-level as well as entry-level professionals have also taken up our Hadoop course and benefited from it. 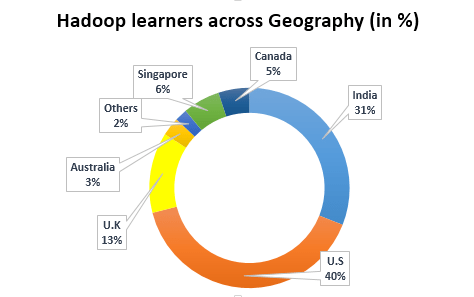 We take pride in the fact that we have more than 26,000 Hadoop learners spread across the world. Our Live-Online training has enabled people across the globe to benefit from our training. Besides India, our learners are predominantly from U.S, followed by U.K, Australia, Singapore, Canada and rest of the world. We owe our success to our Learning Methodology, which has helped achieve so many learner’s dream job. 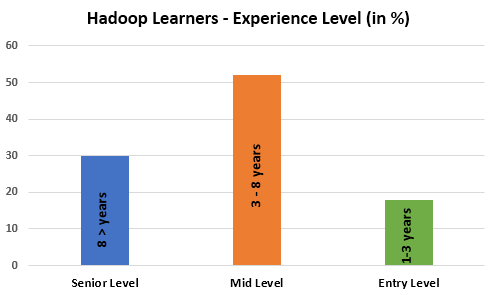 How essential is Hadoop training. Career Advantages through Hadoop Certification. Big Data Engineer Salary – How Much Can You Expect As A Big Data Engineer? Why Should You Blend When You Can Already Join In Tableau?